Ever been at a loss for words? Up against a deadline, and in need of the perfect words and colloquialisms? The Expert Speaker Module plugs right into ThoughtOffice to help you clarify your message, locate associated topics, and keep your presentation on track. 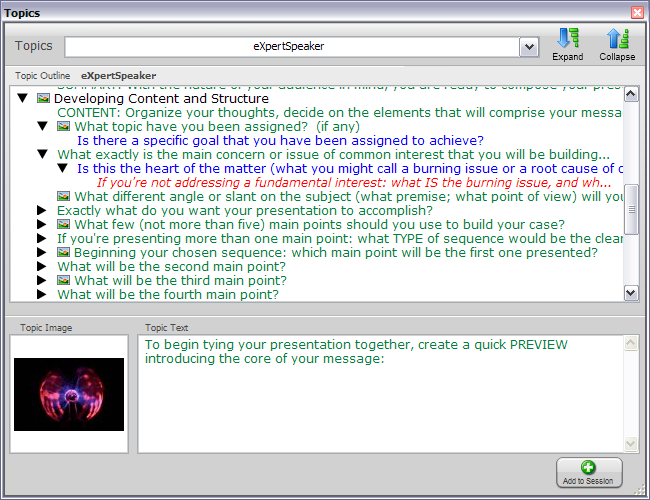 ThoughtOffice Expert Speaker helps you to prepare, write, and deliver persuasive, energizing speeches and presentations. This module can be used to quickly prepare for corporate PR planning and think-tank sessions, and can be used alone, or together with other ThoughtOffice content modules. The questions and guidance contained in ThoughtOffice Expert Speaker are the result of many hours of interviews with successful speakers and presenters. We got them to tell us how they create great presentations, from start to finish, then condensed their years of experience into one comprehensive resource. Used by successful executives and presenters world wide, Expert Speaker is their “secret weapon” for developing effective speeches that are both well received and have a lasting impact.